As a release/antistick agent; used in plastic injection moulding, fibre glass moulding, footwear industry, ceramicware production, rubber articles, oven shelves not in excess of 315°C. 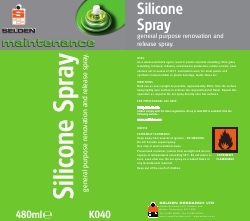 Lubrication uses; for most plastic and synthetic/natural rubber or plastic bearings, textile fibres etc. Hold can as near upright as possible, approximately 20cm from the surface. Spray lightly over surface to achieve the required level of finish. Repeat this operation as required. Do not spray directly onto hot surfaces.